Urgency. I reckon this is the best word. For they were always urgent. Midnight Oil was aggressive, and Sherbet was summery. But even when they were brooding, Skyhooks was urgent. Learning of their 1991 reunification tour, some mates and I instantly booked our tickets. However, on the day of their Adelaide concert I awoke 565 kilometres away on the West Coast as I had to pack up my Ucontitchie Road farmhouse for the move to Kimba. With my earthly goods flung through the front door of my new house, we leapt into my mate’s SS Commodore, pointed the 4.9 litre beast eastward, and rumbled the five hours, through a January thunderstorm, to North Adelaide’s Old Lion Hotel. We arrived with moments to spare. The pub already stinging in its smoky, hot fug. There were but three beers on tap. Red Symons was at his belligerent Red Faces best. It was a night of huge fun. I love crowd singing on a live album. It amplifies the sense of being there, when in all likelihood, you weren’t. Great examples include “Army” from Ben Folds Live and,” Don’t Look Back in Anger” by Oasis, but supreme for me is “All My Friends Are Getting Married” from Skyhooks’ Live in the Eighties. When Shirl invites the crowd to sing the chorus they do in such an adoring fashion. Back at the Old Lion this, too, was a highlight of that summer night. Bearing this in mind, Ego Is Not a Dirty Word is their finest album. I know that Living in the Seventies is the much-loved debut, selling over 300,000 copies, and enjoying the infamy of six of its offerings being banned. But, on this second release, there’s an increased breadth in the songs, with “Love’s Not Good Enough” musing on suburban loneliness, “Smartarse Songwriters” featuring Greg Macainsh’s meta-cognitive explorations, and the title track, pushing the patience of many (I can’t imagine Sir Joh was a fan) with its brazen reference to the triumvirate of Richard Nixon, Leonard Cohen, and in an Australian music first, Jesus. My favourite is side 2, track 2. I know it’s a hundred types of wrong but I recently played it in the car for our boys on the way home from karate. On the first note of “Mercedes Ladies” they both giggled at the larrikinism of bass line, the cheeky guitars and Freddie’s comical tom-tom drumming. It rollicks along with the musical highlight the double hi-hat chick at the end of each line. It’s a great way to spend three minutes, and encapsulates the band, their time, and their legacy. 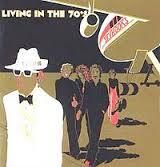 In this, as in much of their material, Skyhooks satirise the suburbs while also rejoicing in them. Of course, we’re all apprehended by our creative context. Even here in smug 2016, history will eventually scold us. 1975 imprisoned many with multiple charges: sexism, homophobia, stereotyping. But despite this Skyhooks also pioneered themes concerning the suburban and the local. It was music of the largely untold other; it was not of NYC or London. Such is the significance of Skyhooks for me that the mention of Carlton evokes the song first, and the footy team second. The band’s collected lyrics still generate a google map of Melbourne, and a reference to Toorak or Balwyn returns me to my original conceptions of the city by the Yarra. If the Beatles are Liverpool, and the Rolling Stones are London, then Skyhooks are Melbourne. Their music has always presented the geography of a highly human environment, as there’s colourful pictures of grimy pubs, menacing streetscapes, and widescreen vistas too. It was in my school mate Lumpy Nixon’s lounge room (I’m sure there were ceramic ducks flying up the wall) that I first saw, and heard Straight in a Gay, Gay World. I was mesmerised by the guitars on the title track, and the sonic trickery of a swarm of insects hovering overhead on the outro, moving from the left speaker to the right. I was fourteen and this was beyond cool. The album’s artwork gripped me equally with its triptych of a solitary black sheep, butcher shop and lamb dinner. It was the first humorous cover I’d seen. The art often functioned as a portal to an album’s narrative. I was especially intrigued by Pink Floyd’s Wish You Were Here, and tried to decipher the cover photo of the two business men, one calmly ablaze, shaking hands on a Californian backlot. However, I couldn’t unlock its mystical meanings. In our age of Spotify and digital downloads, these happy distractions have largely disappeared. But vinyl’s fighting back. And finally to Shirl. He’d a remarkably complex voice, blending a tradie’s building site swagger with the footballer’s front-bar cockiness. It was effortlessly confident, and also reassuring, saying, “Why would you live anywhere else?” as it slapped your back and shouted, “Forget about it, I’ll buy you a beer!” He sung to, and for, us. But, his vowels were knowingly crisp and aware of the telling subtext. He delivered his stories with affection, while also investing the songs, as appropriate, with a sneer. “Million Dollar Riff” could be his best performance. Shirl was the perfect front man. I love that I can go years without listening to a band, and then one afternoon find myself dragging out a dusty CD, and with the opening chords, being teleported to a distant, thrilling place. With Skyhooks that place is removed and unreconstructed, but from time to time, I really enjoy going back there. Just before her weekly massage Catriona Rowntree eyes the camera coquettishly. The Getaway audience is transfixed. Where’s tonight’s rubdown? Fiji? Ah, lovely. But it’s about her voice. A voice, some would suggest, belonging to the blissful space between sleep and waking. Like Catriona in her fluffy bathrobe, sparkling shiraz is also distinctly Australian. No matter that the rest of the planet views it like a toasted cheese sandwich in India. October long weekends. Our throng stayed two hours’ north of Adelaide at the Clare Country Club. We’d observe an annual routine. And come next October Colleen’d deliver these same lines like a poem. A poem performed by the cantankerous employee of a regional Chinese eatery. There’d also be a winery tour. One stormy Sunday we coasted into the Wilson Vineyard near Polish Hill River. At the counter, we began our work with Freddie Flintoff gusto. A single sip. The subterranean purple hue, the mesmerizing flavor, the sassiness. It was dangerous fun. It was a sparkling shiraz. It was called Hippocrene. I was enthralled. Tellingly, the parents-in-law smuggled a bottle into England for us to share on my birthday. If a Google map showed who was drinking what across Europe, then we were likely the only sparkling shiraz slurpers. I didn’t care. Hippocrene was an occasion wine. Sometimes it’d be Christmas. Sometimes the occasion would be Sunday. We only ever had two or three bottles a year, so at the easing of the cork there was always frisson. Like the Greek civilisation from which it inherited its name, one October the cellar door assistant announced that Hippocrene was no more. “Have you any left?” I begged. Out the back were a few bottles of the ’96. We bought half a dozen. This can open the batting at your barbeque. Unlike Watto, it doesn’t plonk down a dumb left pad and get struck plumb. More like Boof, it’s good for a chirpy thirty. Surprisingly sturdy, it boasts drinkable complexity. And it receives extra points for having the word “chook” in its name. The Black Chook’s about $18 in Australia, or approaching a hundred bucks and two months’ national service in Singapore. A tremendous wine by the late Barossan, Peter Lehmann. Rather than going to a liquor chain this seemed a retro, fun thing to do. Not so much slaughtering a cow because you fancy a hamburger, but more like listening to Revolver on vinyl. A profound, exotic gargle, the Black Queen is about $40 in Australia, or the price of an inner-city apartment here on the tip of Malaysia. Like a glass of agitated Ribena®. You’d be better off with a wine made by Midnight Oil warbler, Peter Garrett. Andrew Garrett once tried to sue Westpac for- raise your little finger to the corner of your mouth- eleven billion dollars. I’m less chance to drink this again. Here’s a confession. Langhorne Creek’s an hour south of Adelaide, but it was only three years ago that I first visited. For me, that’s the oenological equal of never having heard 16 Lovers Lane by The Go-Betweens. The Bridge Hotel serves lunch, and you can sit outside, under the obliging gums, with a Coopers Pale Ale. It’s parched and dusty, but the vines often enjoy winter flooding from the Bremer River. Bleasdale Sparkling Shiraz reminds me of writer and Exeter Hotel inhabiter, Philip White. When the Advertiser was still a newspaper, he penned a column called Drinks. White once described a wine, I think a Greenock Creek, as being “full of iron and steel, and women and children.” Obviously, this also summarises the Bleasdale. A snip at $20 for Tony’s Team Australia, or if you’re from the Republic of Singapore, similar coin to a luxury holiday on Koh Samui. Sparkling shiraz is the viticultural Skyhooks. Unheard of in Europe. Never caught on in America. Yet enduringly significant and loved in Australia. For a certain demographic, both provide a cracking soundtrack to backyard barbies.